A randomized old-school, roguelike, first-person shooter. Grip Games is bringing Terrible Posture Games’ Tower of Guns, an “old-school, roguelike, first-person shooter,” to PlayStation 4, Xbox One, and PlayStation 3 in early 2015, the publisher announced. First released on PC in March, the game features randomized levels and enemies, and is made for players “who just want to get a big gun, shoot stuff, battle gigantic bosses, upgrade their abilities, and modify their gear.” There won’t be any story or NPCs, there’s just the good guy (the player) and the bad guys. If you get to the end of the game, you win. However, that might be difficult. Grip Games says the game will be ‘brutally difficult.’ Each time you die, you’ll be sent back to the first floor, but stronger and better equipped. The levels and enemies are randomly generated for each run, meaning you’ll be playing a different game for every restart. The game offers over 20 weapons and “countless modifications and upgrades.” Players an collect items and perks that will assist them. Strafing and double-jumps are present, while cover mechanics and stealth missions are not. 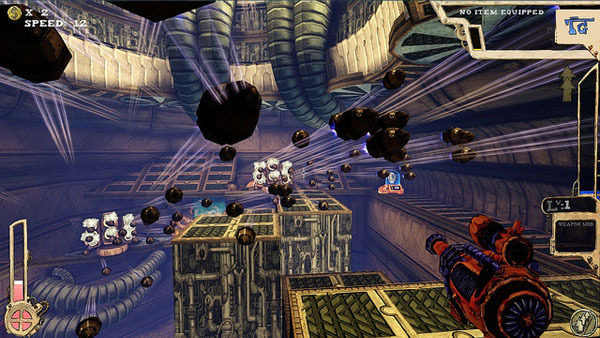 It’s a “bullet-hell style game,” according to the developer.